Comfort and storage system for the driver and front passenger. For access to the closed storage box, lift the lever to open the lid. 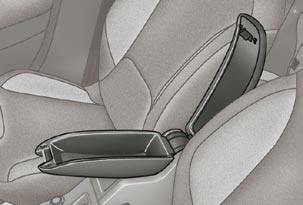 For access to the open storage box below the armrest, lift the complete armrest towards the rear. These can be used for portable devices (mobile phone, MP3 player...) which can be connected to the USB port/Jack socket or charged from the 12 V socket in the centre console.